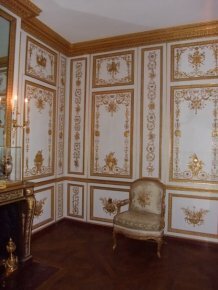 18/2/09 – Heritage – Versailles, Musée national du château – Louis XVI’s Garde-Robe (wardrobe) is a small room (barely 13m2) located just to the left of the King’s Bedroom. It was created under the supervision of the architect Richard Mique, and was finished in 1788 so the king had little time to enjoy it. He used it as an office which also held a bathroom cabinet concealed behind one section of the wood paneling. The extremely refined décor of the paneling (ill. 1) was sculpted by the Rousseau brothers. It contains a complex iconographic program with symbols illustrating business, agriculture, the navy, war, the sciences and the arts. 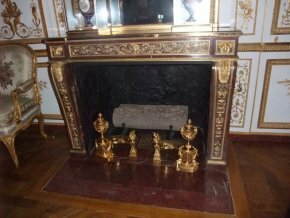 The original fireplace (ill. 2) is undoubtedly one of the most beautiful ones in Versailles. The remarkable bronzes on it are by Pierre Gouthière, who was no doubt also responsible for the locksmith work in the room. doc1541|right>This example of art came down through the centuries virtually unscathed. The fleurs de lys, destroyed during the Revolution, were replaced during the Restoration. The panels were removed in 1939 and reinstalled after WWII. The work consisted mainly in restoring the décors and the bronzes while preserving the original gilding which was generally in fine condition. Some of the sculpted elements revealed engraved drawings, for example geometric figures on an open book and Newton’s name on the panel symbolizing the sciences (ill. 3). news item in French of 25/6/07) than the exterior. Nonetheless, he could not resist the temptation of a reconstruction : two medallions with the likenesses of Louis XVI and Marie-Antoinette, hammered traces were apparently found, were redone on one of the wooden panels, and the seat for the chair (in the bathroom cabinet) was restituted. These are merely venial sins in light of the fine work on the whole.